Stress and anxiety are looked at together because they seem to run together. When you’re stressed it can lead to anxiety and when you’re anxious you feel stressed out; the never ending circle. Stress is an inability to respond to a perceived threat in a manner that is appropriate. Stress occurs due to environmental and internal factors. Environmental (things or people around you) factors could be your job, your kids and internal factors could be your diet and your emotions. Signs of stress can include nervousness, lack of sleep or poor sleep, loss of energy or fatigue, overeating, headaches and tenseness of the muscles. Stress affects each person differently but the sign above are some of the general ones. What one person considers a stressful situation could be seen as a challenge to another. Whether the threat is real or imagined the body and mind goes through three stages. 1. Alarm Your heart is beating over time and your adrenal medulla releases epinephrine and nor-epinephrine. 2. Resistance A means of coping with the stress is sought. adrenal cortex releases cortisol and other hormones. 3. Exhaustion Occurs when the body has sustained the stressor for a prolonged period of time. Anxiety is described as “excessive and irrational fear and worry” that permeate every part of someone’s life. It is constant, intense, and prolonged fear that has no apparent reason. It’s your body’s way of coping with something that will happen in the future. Fear is False Evidence Appearing Real. There’s a perceived threat and the body takes action to avoid or escape it by kicking into gear the “fight or flight” response. Some signs of anxiety are sweating, trouble breathing, trembling, dilated pupils, headaches and muscle tension, chest pain or discomfort, nausea and dizziness. Anxiety is described in the medical field as a mental illness or disorder. In Canada and the U.S., it is one of the most common illnesses. In the United States, it affects almost 25 million people according to the American Psychiatric Association. In Canada 1 in 10 people suffer from the illness according to the Canadian Mental Health Association. We may recognize and understand all of these terms mentioned above and may even have been diagnosed with one of them from our research but what to do. Truth is that we don't appear to ever get well. 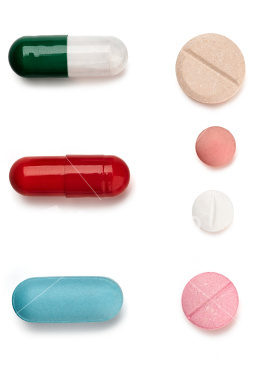 The drugs that we are given for our "condition", is not intended to heal us. HOW DO WE HELP OURSELVES? Well, this information is not intended to replace a doctors diagnosis and or care. I am not a doctor either. And this is my disclaimer that I’m providing information only. Use it at your own discretion. If any of the information feels right for you then do further research and find out. My information is not new and is available in books and websites with a little research on your part. My intention is to provide a comprehensive, inclusive and all in one place, the information that you’ll need to help yourself in some way using natural medicines. The field is a broad one and the information that I provide is mainly about what I know and have experienced myself. Please be open to different and or new information coming to you. The Natural Medicine Guide to Anxiety, by Stephanie Marohn is a terrific book that lays out the many alternative therapies that one can use for care. It is an extensive book that goes into great detail and provides resources at the end of the book. That's how I found out about Thought Field Therapy and Bach Flower remedies etc. One very important note from the book that struck me especially was that there are five levels of healing. Dr.Klinghardt a world-renowned doctor in the field of Neural Therapy, developed this 5 levels of healing; Physical, Electromagnetic, Mental, Intuitive and Spiritual. Think about it! 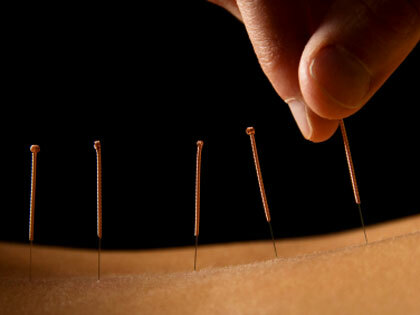 Traditional medicine's main focus is usually on one and maybe two levels; physical and mental. That's why we find ourselves unable to heal completely sometimes. We are after all spirit in a physical body. This had been a light bulb moment for me. 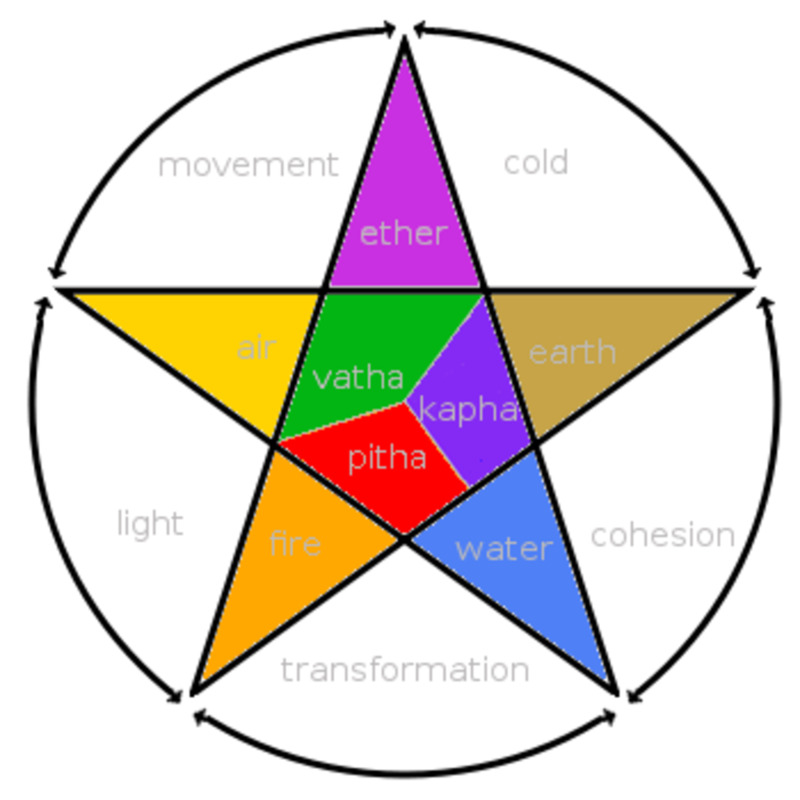 The switch clearly came on when I read about healing on these 5 levels. In my own experience, I have used so many forms of self help medication if you will, and wanted to share some of that knowledge. My intention is to cure myself on all levels using natural medicines . Get started then. Always perform the Healing Code in a quiet, private, place where you can relax without distractions or interruptions. Aim all five fingers of both hands at the healing centers listed below for the amount of time indicated. The fingers need to be 2 to 3 inches away from the healing center they’re aiming at. Continue to rotate through the positions in the specified order for 6 minutes. Do this 3 times per day. You can start with as little as 1 per day, and increase frequency as needed. Dr. Roger Callahan, is the founder of Thought Field Therapy or TFT. There it is. We are energy. Within this body that we use, our energy is disturbed with negative emotions and outside stimuli that cause a blockage of that flow. EFT, came about because of Dr. Callahan's work. EFT was adapted from his original work because we are emotional beings as well as physical and spiritual. Anyway I started with TFT and found that it worked but it did not eliminate my problems as it does for others. Probably too skeptical about it working when it seems so easy. Truth be told, I still crack his book TAPPING THE HEALER WITHIN , when I need relief. I like the EFT work but dislike the fact that different practitioners use different points to eliminate a particular problem. I find it confusing but I still use it. I use the EFT Blocks for clearing out any negativity that I might have to get the healing that I want. I'm so glad to have found this technique. I love using acupressure on myself. Talk about getting instant results. As soon as I start using acupressure points on myself, I feel my stress lessening. The only drawback is having my hand get tired too soon. 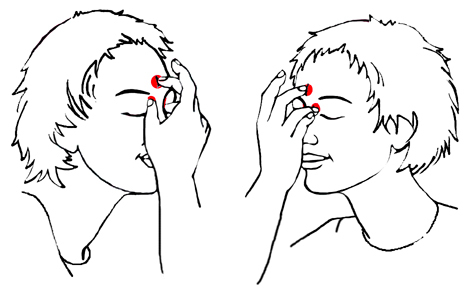 When you're using acupressure on yourself, be sure to press the point with a finger or object and do it for about 2 minutes. I like to do it on both sides of the body part that I'm working on. One at a time of course. I am also a fan of acupuncture. Can you tell? It gets expensive though but it is one way of keeping your chi flowing and the stress level down. Friends ask me if it hurts to do acupuncture. The answer is sometimes. 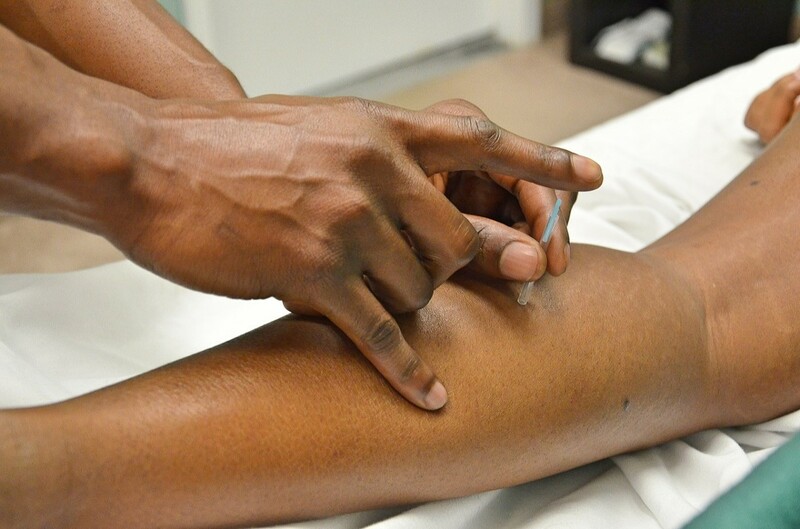 Whenever there's a blockage somewhere in the body and if the acupuncturist inserts the needle into that meridian to reduce it, I find that painful. To reduce it the needle is turned counter-clockwise and I do indeed feel it. 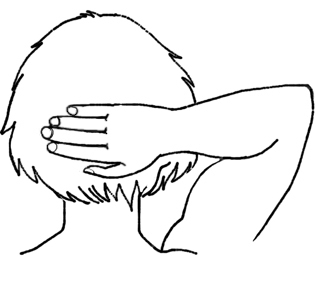 Here's a technique that uses acupressure techniques with a script or set of words to activate healing in the body. You have to try the technique as everything else, to see if it works for you. The TAT was developed by Tapas Fleming in 1993. 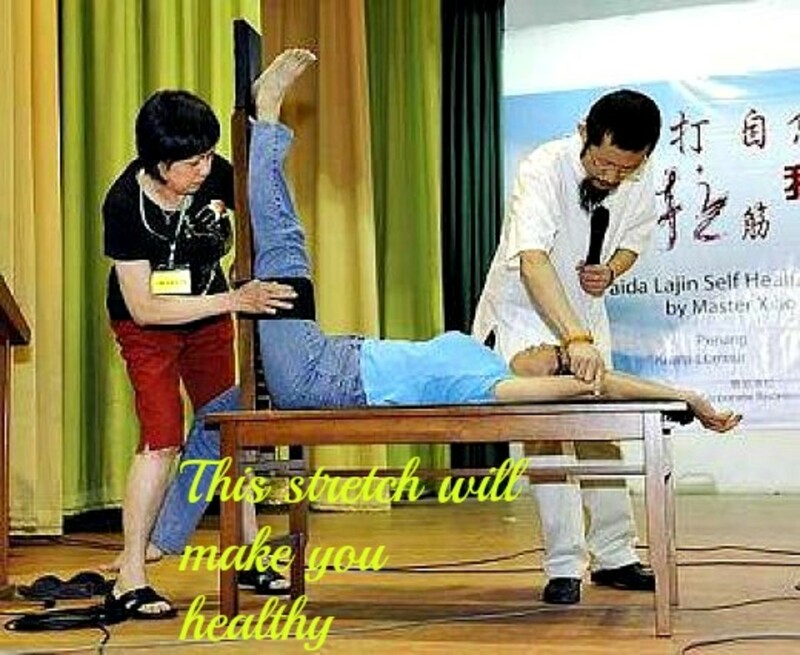 She is an acupuncturist from California. You can go to her site at tatlife.com. Personally, I find the technique long and somewhat confusing. Even so, I'm important so I'm willing to do whatever it takes. 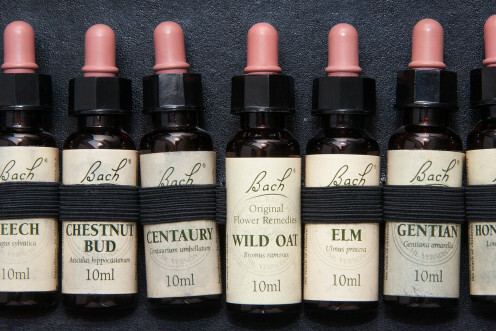 Dr. Edward Bach, a bacteriologist, physician and pathologist is the founder of 38 flower remedies. The remedies work on an emotional level to help one get well. See their site for a thorough explanation of how they work. According to their site Mimulus is the remedy for known fears and Aspen for unknown fears. I know that this works. I've used it for many years and have gotten wonderful results. Their Rescue Remedy is a boon because it has a mix of 5 blends for when you're in a crisis (emotional, like a breakup with the boyfriend) situation. Mudras are hand expression used in various forms such as meditation and healing. Healing the body could not be simpler than with music. Music has the power to elevate and allows us to feel better. That's why when we choose music we should choose carefully. Listening to some that is sad, well guess what, that will become our vibration. I found this music through links from some of the other healing modes that I use and what a pleasure it's been. Mark Romero's, according to his website http://www.markromeromusic.com/ music has that power to heal the body and spirit. The tones that he reaches when playing his guitar enables our energetic body to heal from stress and anxiety. 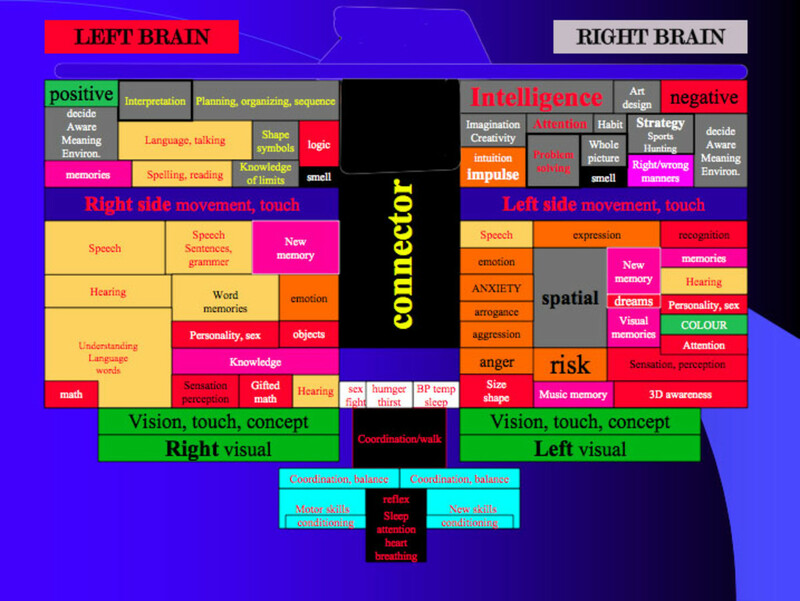 Within the music/sound paradigm are paraliminals. Paraliminals use words and music in a guided meditation to help in many areas of one's life. Paraliminals means "beyond the threshold". When listening to paraliminals, it's best to use stereo headphones because two different voices are heard. One voice comes from the left ear and the other, the right ear. This allows the subconscious to take in the information without the conscious mind filtering it. An essential oil is one that is concentrated and comes from the "essence" of a plant. One of the way that it is taken from the plant is by means of using steam. Parts of the plant, such as the bark, leaves or root are used during distillation. 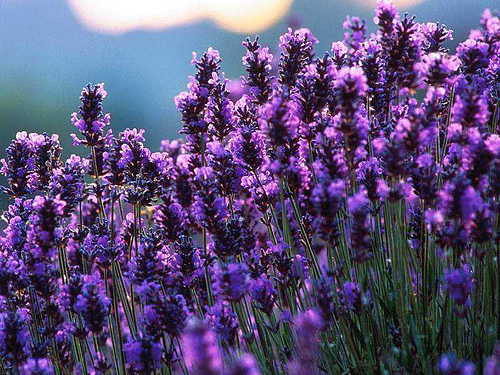 Lavender, a drop or two placed on a pillow before bed has been noted to help one have a restful sleep. I actually put a drop on the collar of my shirt so that I can inhale the smell whenever I want to. Lavender happens to be one of my favourites too. Now, there are many oils out there but use ones that are organic or natural they are the best. Oils are used for many purposes too. It can be used in a diffuser to scent the air or for aromatherapy, massage etc. Find the ones that appeal to you and will work for you. Get ready for me to give you a humongous list of vitamins and mineral here. Just kidding!! There are many available to choose from and it takes some research both online and trial and error for you to sometime find the ones that are good for you. Since anxiety is a challenge for me (notice my words please because you have to pay attention to what you're saying. it's all part of your energy and what happens to you), I take vitamins that support a healthy heart. CoQ10 or Co enzyme Q10 is one such vitamin. Ubiquinone, it's other name, can be used for those with high blood pressure. If vitamins are not your thing, eat lots of avocados since it's high in it. For some vitamins, it's best to get a pharmaceutical grade for better absorption rates and better quality ingredients. Some of the regular drug store brand is filled with unnecessary items and very little of the actual vitamin so have a care when buying. Note that the better brand will cost more and it adds up month after month. CoQ10 is very expensive. It bothers me that these health foods do not cure us but keeps us in the same place as we were taking regular pharmaceuticals. Vitamin E is an antioxidant again that is used for a healthy heart. You can do it naturally also by eating more almonds, hazelnuts and I hesitate to say peanuts, since they are such a big part of nut allergies; seeds such as pumpkin and sunflower. Vitamin C is another great antioxidant etc. Yep, plain old vitamin C, can help you to calm down. It used to be my secret and then years later my body seemed to get used to it and it stopped working for me. Magnesium, a mineral that keeps the heart healthy and the immune system in order is a staple on my shelf since I do also have that wacked high blood pressure. Here's a product that I've been using and it has given me good results. Natural Care, Anxiety Relief it's a homeopathic remedy. I think that I need to explore the homeopathic stuff more. Now, this is a short list only because there's so much out there for anxiety. Plus, you'll get tired of taking too many anyway. I hope that something mentioned here helps. Note: choose a good brand because many of them have a load of fillers that you don't want or need such as magnesium stearate. This is only used by the companies to keep the capsule ingredients from sticking to the equipment. Here's something new that I just wanted to share with you and add to the hub. I know that we are energy but I didn't know anything about energy work. As I was going about my business of EFT, I found Donna Eden's work and decided to give it a try. Who is she? Well, apparently she's the guru of energy medicine. She's been about it for many, many years. Since I'm open to receiving help in many ways, I started doing her five(5) minute routine daily. Of course, I get lazy too. When I skip it, boy do I quickly go back to stress. Also the MIR Method or Mental Intuitive Reset. A reset of mental thoughts, beliefs and emotions to help you feel good. I really like this method. For two weeks I've put everything aside and I have just been concentrating on using this method alone. The first day that I used it. I felt so tired and I went to sleep shortly after. It was the first time in a long while that I had a good long night's tsleep. I actually slept for about six or more hours straight. My sleep had been so disturbed that I would sleep for three to four hours and would awaken and have a hard time returning to sleep. Other things that I noticed were headaches although that was mentioned on the website www.mirmethod.com, gassiness or flatulence. My anxiety decreased and calmness started to take its place. *There were videos available from Youtube in the past, to go along with this method but they have become private for whatever reason. The video became available again so I have added it again. I have not used this method in quite awhile. I received some benefit as mentioned above when I did. I found myself falling back into old habits such as the foods I had given up, I stated eating again and this had a direct effect on my well being. It is a constant practice to maintain and keep your body at an optimum level. Heck, the truth of it is that once you start to feel good you start to forget what you did to get here. You begin to let things go even though you know what will happen. Here are a few Yoga practices that should immediately help with calming. Our breathing or the breath, shifts between the right and left nostril. We breathe through one nostril for about 2 hours and then it alternates to the other as part of our natural flow. When we deliberately change the flow from one nostril to the other we help to revitalize the body, improve brain function, restore the body's biological rhythm, soothe an anxious mind, helps with sleep and merge left and right brain function. Use right thumb to close off right nostril. Place the pointer and middle finger on the bridge of your nose. Inhale slowly through left nostril. 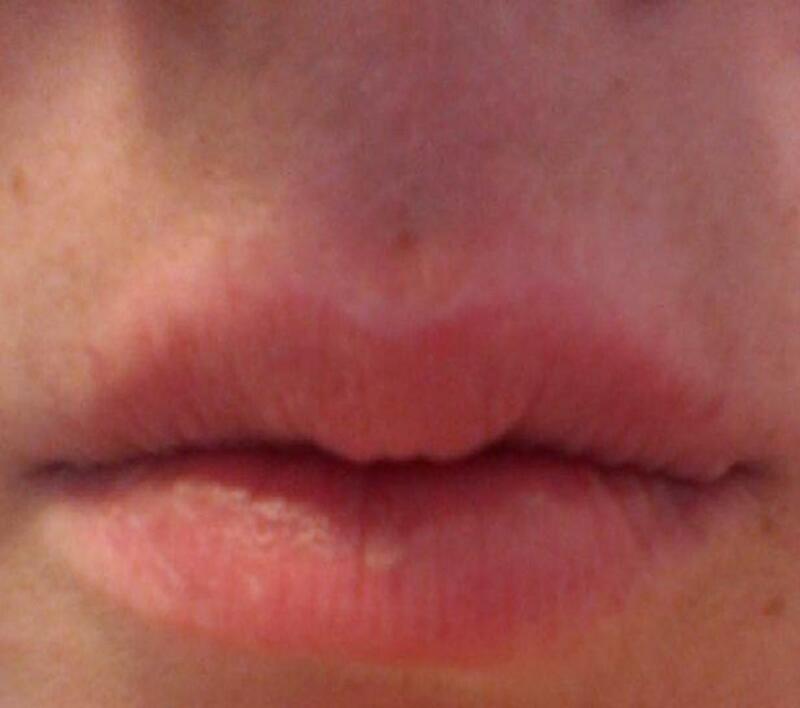 Close left nostril with ring finger and release thumb off right nostril. 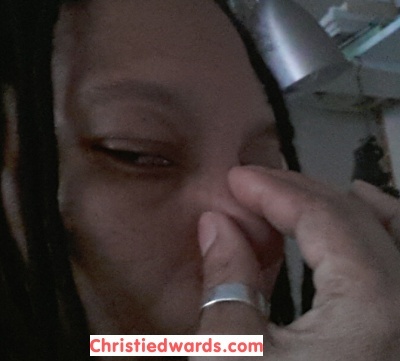 Use thumb to close off right nostril. Breathe out through left nostril. This is one round. Start slowly with 1 or 2 rounds and gradually increase.Be easy. Sit quietly for a few moments after you have finished. Do not hold your breath if you have high blood pressure. Practicing on an empty stomach is preferred. This pose soothes the nervous system and promotes harmony and deep relaxation of body and mind. Lie on the floor near the wall. 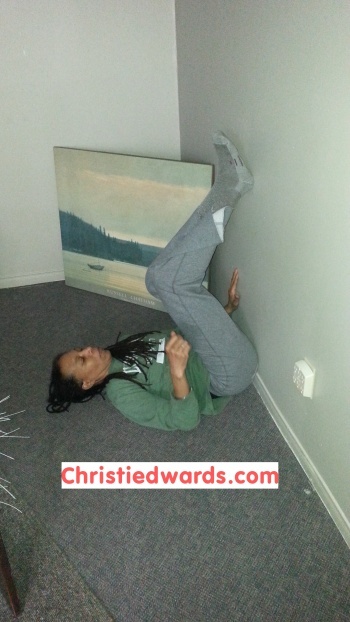 Bend your legs and carefully move your body while getting your bottom as close to the wall as possible. 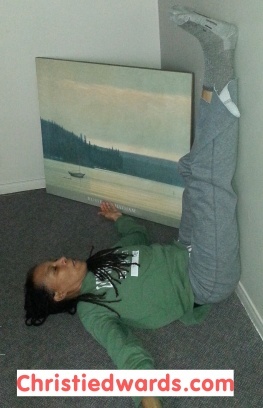 Raise your legs to the wall and relax. Inhale and exhale slowly while letting go of any tension. 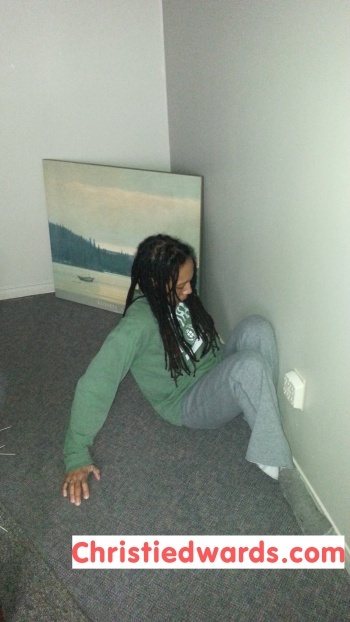 To come out, bring the knees into your chest and slowly roll to your side. Check with your doctor before doing this pose. Your legs may fall asleep during the exercise. Come out of the exercise if you feel your legs begin to tingle. So, I found myself having periods where I felt really good and then suddenly there would be a bout of anxiety. I would fight it with remedies, exercise, being in nature etc and then I would be ok again. I started using Dr. Schussler's mineral or tissue salts. There it is. Just one more magic pill to cure me. I could not seem to get that elusive cure. What did I have to do to feel good all of the time? I thought that I was doing everything. I have tried so many methods and where did it leave me? Really, that one thing that will fix you is....you. As I have been out here searching again and again about how to help myself, I realized that I was right where I started. You can take all of the pills and fixes in the world but it all leads back to you. First thing is, and you won't believe me when I tell you. Realize, that you don't need fixing. Yeah, you think that I am full of crap. What my intuition or higher self kept trying to tell me was that I needed to feel the anxiety. What the hell huh? See, I have been running and or fighting this anxiety for a long time. Now, it was time to face it. No more fighting. Peace! I needed peace. In order to get it I have to face this thing that had taken over and taken away my life for so long. At first, I though it was an infomercial blog. You know what I am talking about. A blog pretending to help and was just about making money with promises that don't deliver. I read and I kept reading. Then I saw some of the information that had come to me. Here I sit, at 5:00 am in the morning writing and sweating because the anxiety is there and I am not gonna pretend anymore. It bugs the hell out of me but it's me right now. Now, this guy Paul David has a book called At Last A Life, which I have not bought yet. (if you find yourself with an extra copy please, send it to me) I found his story believable and I want full and total recovery but until I do, it's about feeling my feelings and accepting myself. Please know that I am not telling anyone to choose to do the same. We each have a responsibility to choose wisely for ourselves. This is the route for me right now. I really want this anxiety out of my life for good. Allow me to close this hub with the hope that the info here will benefit you, the reader, in some way. I analyses the whole hub that your hub is very interesting and helpful to us to remove the stress.I thankful to you to give such excellent advice. I Just found your hub and this is very interesting and comprehensive information. Thanks for sharing. vote up and useful! Excellent hub. You did a great job explaining everything in an interesting and informative way. Bookmarked, voted up and useful. Thanks for sharing your knowledge. @couponalbum thanks for your comment. What a great hub. Liked your ideas. Will try mudras. @justom, Yeah, acupressure is a God send. Thanks for reading my hub. @Micky Dee, Hey, you could ride over too. I know how much you love your bike. Do you have more than one? 'Cause you know, one has to rest while the other is busy or sick or....whatever. Gosh, it's good to yap to you. I missed you boy. @2besure, I like to look at other means for sure. Thanks. There are so many other means of treating stress and anxiety other than medication. 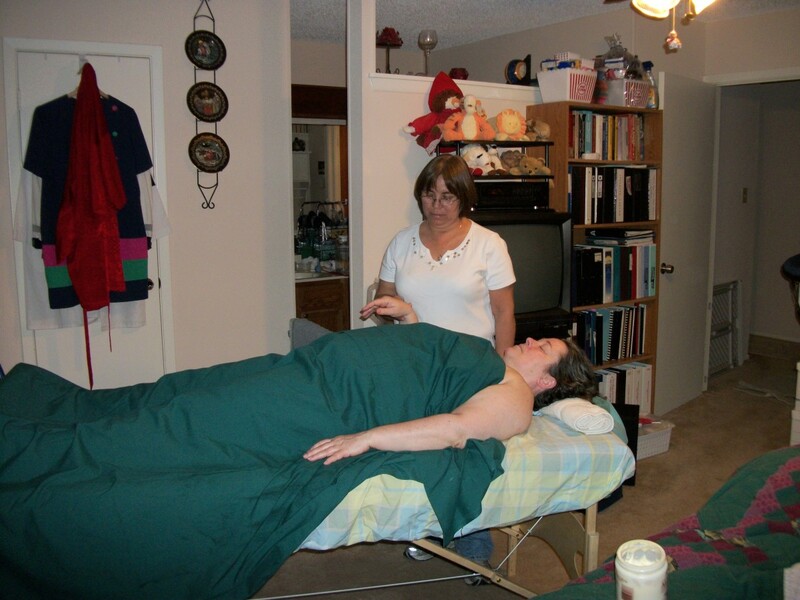 It is good to know, people are becoming more open to alternative treatments. I have found EFT to be very helpful. Tom beat me here by 21 hours! I ran over as fat as I could! Oh well. This is really good Dear ChrisEddy. I am in a little stress bind (last night more so) but this is great advice. I love you Girl! But you know that.